Have you been eyeing that snazzy new smartphone for a while? Good news — you don’t have to wait months to save up. With Clix, you can apply for a mobile loan as soon as you spot that sleek model in the store! So try us now — you’ve waited long enough! We don’t want to keep you hanging. Which is why our applications are quick and easy! We want you to get what you want, . That’s why we offer up to a 100% cover on the phone’s value! You can’t enjoy a new phone while worrying about EMIs. So, choose from our flexible repayment options! How do I check my eligibility for a mobile loan from Clix? What documents do I need to submit with my application for a mobile loan from Clix? What will be the tenure, down payment, EMI, and interest rate for my mobile loan? 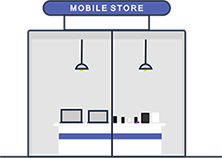 Mobile phones can be bought on easy EMIs on the Clix Capital EMI Network. Loan can be availed equivalent to the cost price of your favourite product and dividing the same in EMIs. Where in India can I buy mobile phones on EMI? We are currently offering products on EMI at select outlets only. To find out our partners in your city, visit the store locator section on this page. Once you have decided on the product that you wish to purchase, all you have to do is to walk into any of our partner store, contact our representative and he/she will take you through the whole process of availing this loan. It’s quick, easy and simple. Apply now for a simple, fast, and accessible mobile loan from Clix!